I know, I know…I just posted a granola recipe a few weeks back, didn’t I?! Yes I did, but this momma is in “get ready for summer” mode, which means I like to have some cold breakfast options readily available for busy days spent outside – and for muggy mornings that I don’t feel like turning the stove top on for fried eggs. We’re certain to have more smoothies for breakfast in the summer, but I like to keep things changed up so we get plenty of variety. 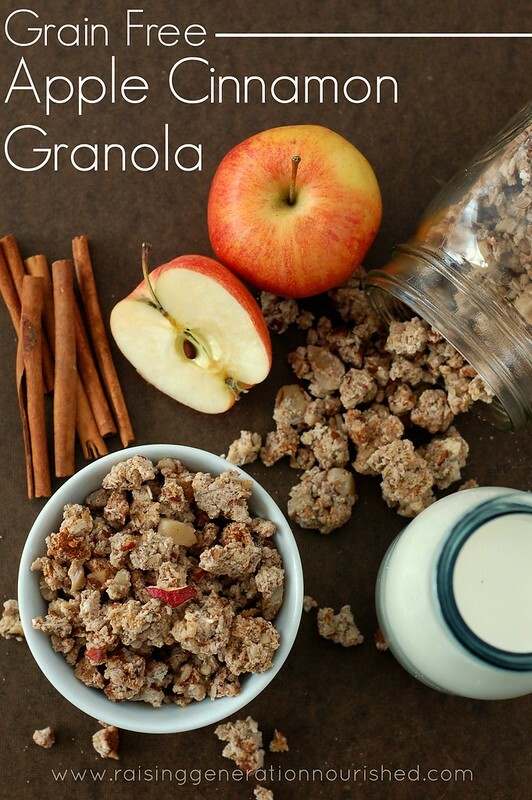 We really love our staple simple granola, but this one has actually become one of my favorites, and my kindergartener requests it a lot. It has the most incredible light, crispy texture that even little kids can chew – my 18 month old will eat it in yogurt or with a little raw milk or coconut milk soaked into it. While I am not against grains in the least if sensitivities/allergies are ruled out (in fact I think properly prepared grains are great nourishment), I don’t think grains need to be consumed at every meal of the day. If I am planning on having grain heavy meals for lunch and dinner, then I like to keep breakfast grain free. This one also makes a really great yogurt add in for lunch giving a great protein/friendly fat boost to a little one’s meal. Just a quick note on the nut/seed choices! Really anything nut or seed will work here, but I do tend to keep it almond and peanut free. I use peanut butter here and there during the week along with almond flour in baked goods etc, so it is a great idea to give the gut some variety – and this combo of nut/seeds is truly so flavorful! And packed with nutrients! If you happen to be nut free you really can make this all seed based. I really love pumpkin seeds in my granola and Costco usually carries nice bags of them. You can do a mix of the sunflower and pumpkin seeds and add in chia, flax, and/or hemp too! This batch makes…a lot! Which is how I like it so I don’t have to make it all the time. I keep them in gallon bags laying flat in the freezer and it lasts me for months on end. You can certainly half the recipe if you don’t have as big of a crew to feed day in and day out. I like to have some cold breakfast options readily available for busy days spent outside – and for muggy mornings that I don’t feel like turning the stove top on for fried eggs. The first step will be soaking your nuts/seeds. 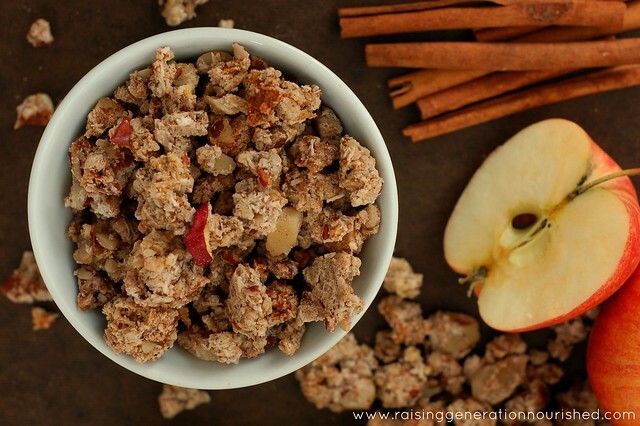 You can either soak them over night and then dehydrate your granola all day the next day. Or you can soak them all day, and then get the granola into the dehydrator overnight. Put the chopped raw nuts/seeds and the sea salt into a large mixing bowl and add water to the bowl until it covers the nuts/seeds by a good inch. Set the bowl in a warm area of your kitchen for 8-12 hours to soak (I put mine under the light in my oven because it is so cold here). The soaking process makes the nuts/seeds much easier on your digestive system to break down and makes more of their nutrients available to absorb! After the nuts/seeds have soak put them into a strainer to drain while you get the rest of the ingredients into a large bowl or container (I use my large stockpot to mix the granola since there is so much! You could use something as large so you can mix up the granola easiest). Add the drained nuts/seeds to combine with the rest of the ingredients. Spread the granola mixture out onto your dehydrator trays and dehydrate at 105-110 degrees about 8 or so hours – I like to dehydrate overnight – the smell when you wake up in the morning is pretty amazing! If you don’t have a dehydrator, you can spread the granola mixture out onto baking sheets and bake at your oven’s lowest temperature until it is dried out. You will need to stir the granola around every half hour but it does work just as good and I did it this way for years! 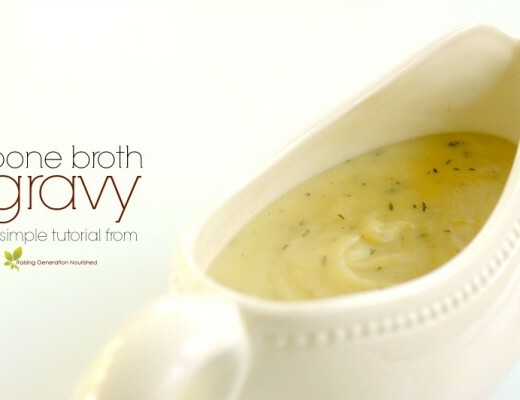 5 Minute Bone Broth Gravy :: Gluten & Grain Free Options! THANK YOU! THANK YOU! so much for this grain-free version. Sending many blessings your way!!! Wow this looks great! Thanks for sharing this awesome recipe. Yum! 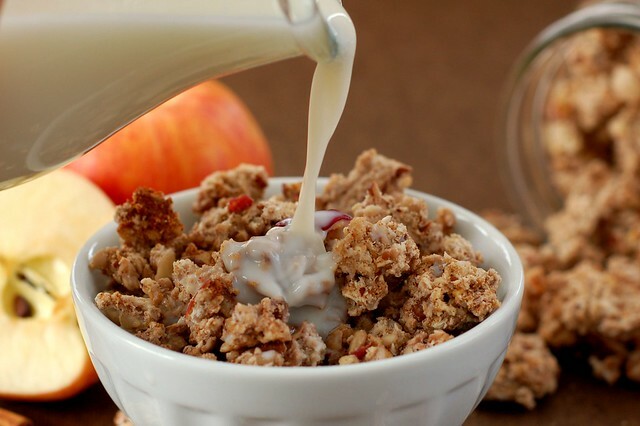 Aren’t homemade granolas the best go-to breakfasts? This one sounds so good! I love that is has a nice amount of coconut and apples – yum! I always add a bit of cooked squash to our granola. The apple would really lend a nice boost. Thanks for the recipe and photos. Beautiful recipe! Looks so crunchy and satisfying! Thank you Megan! Man that means a lot coming from you! So sweet! 🙂 Well, we’re finally making it, today! I got called into work unexpectedly in the midst of our home school day; so the boys are going to help me in the cafe kitchen! We’ll have it dehydrating by this afternoon and hopefully letting it go overnight will be okay. And then we’ll get it out tomorrow morning. The kids will love this so much! OH yum! Granola is so yummy. This one looks super good. This looks delicious, Renee. I love seeing so many wholesome, grain-free options on your blog. Your recipes look wonderful! Thank you for sharing! Pinning! This looks amazing! I really miss granola and definitely want to try this. Pinning! This looks gorgeous! 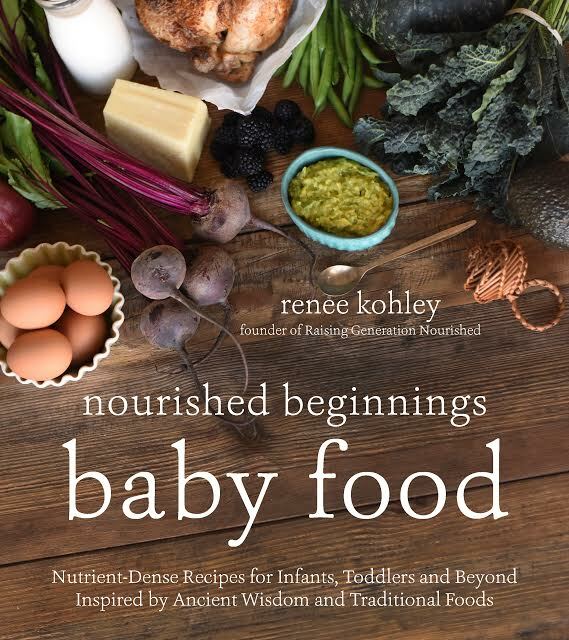 Glad to “meet” you (as a fellow contributor to SHK) and I can’t wait to check out more of your recipes! Hi Emily! So glad to meet you too! Thank you for your kind words 🙂 Looking forward to working with you! Whats the best way to store this after cooked and what is the shelf life? I eat an apple every day. I think I could skip a day and have this instead. 😉 Looks so good! This would be yummy on top of whipped sweet potatoes! I love this recipe. 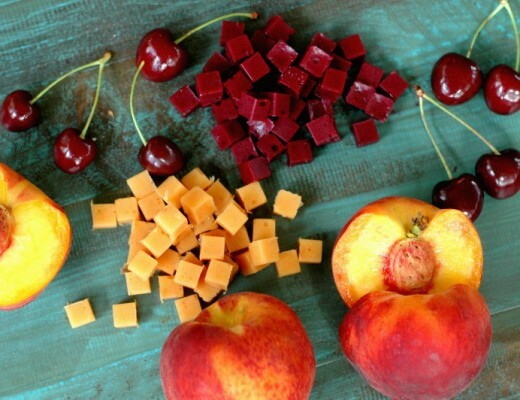 I love how chunky the pieces get … so yummy! I have never been able to get my granola to cluster up like that! I’ll have to give this a try! This looks amazing and sounds so healthy! I bet your house smelled wonderful! This just looks delicious. I bet it’s like eating apple crisp with milk! Hi Renee I was really excited to try this and did the whole batch but it’s not come out at all and I’m so bummed. Wondering if I copied the nut too much? And I soaked them after they were chopped, it’s that correct? It’s very fine and not at all chunks or holding together. Been dehydrating in the oven since this AM…over 8 hours…Any thoughts? Thanks! Hi Tami! Oh shoot – hmmm what oven temp did you use? I do soak after I chop and I chop them actually pretty small because I have little ones eating it – in fact I pulse them up in the food processor so they are quite small. I wonder if the chunks are too big they won’t stick? It should still taste ok for eating and on yogurt etc – I think you are over here from my gift giving post on Live Simply, so if you were planning on it as a gift I really think it should still work as granola. Thanks so much for responding! Yes I had a question earlier from the Live Simply gift post about saving extra batches in fridge bc it wouldn’t all fit I’m my oven and then the first batch was not working so I came right here. :-) I do love all your info and recipes. I think I’ll try again just a smaller batch. I think I had too much on the pan…I had so much!! It just wasn’t drying and finally when started to dry tonight was gray and like dust. I’ll try again! Thank so much. Yes, it sounds like maybe it was just dried out too long. Have you tried another round in the oven? You might try just going a higher heat for shorter time stirring every 20 minutes? The dusty texture you describe makes me think it was just in there too long? I’ve never made granola with soaked ingredients before. Can you dry the granola in a more traditional way, say at 350° for 30 – 45 min, or is it really best to go low and slow with it? Hi Katie! Yes that should work! It may take a little longer than that as the ingredients are “wetter” from being soaked. I would stir them ever 15 or so minutes as well. I hope that helps! Hi! I love your recipes! Just wondering how I can make this if I have already soaked and dehydrated my nuts? What modifications would I need to make to get the same result? Thank you!! I think you might want to grind the nuts up and add some water to them – the “clusters” sorta happen because the nuts are soaked, drained, and wet from the soaking when it is mixed with everything else – so everything sticks together and then once it dries out it can be broken up. Does that make sense? Thank you Renee! I will try it out and just eyeball it. I’m sure it will turn out great 🙂 thanks for your help! My daughter Amelia (age 10) just made her first batch of granola, and I am pretty sure she would LOVE to try this recipe out! Perfect for this time of year! What a lovely granola. I have so much applesauce from last year. Can’t wait to try this. A great recipe, Renee! This one is making me start to crave fall flavors, like apple. Yum! I love the sounds of these. So festive for the Fall! Yummy! 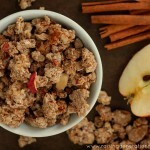 I absolutely love granola and you just can beat the apple cinnamon combo! Mmmm I want to eat this with some coconut milk! This granola looks amazing! So perfect for fall! I can have this granola every morning with a splash of cold coconut and almond milk !! 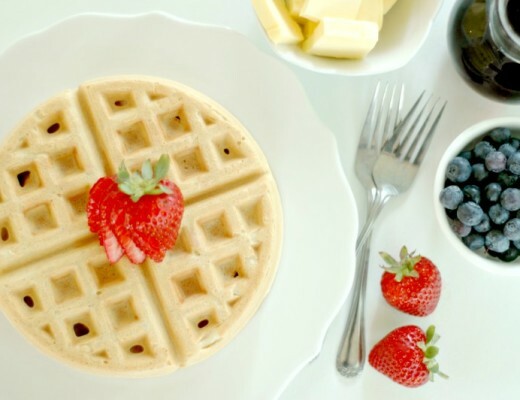 Hmm….So YUM ! 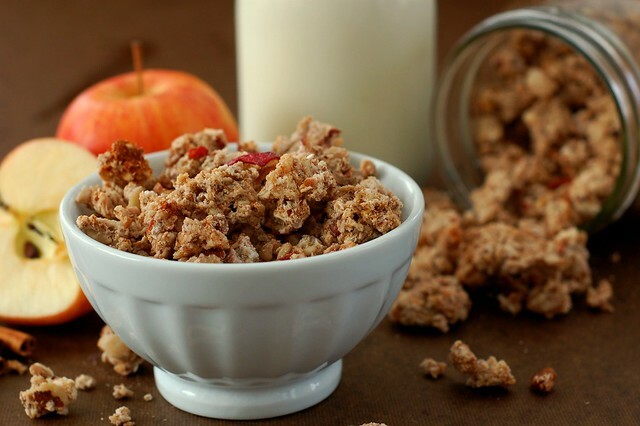 I love the addition of the apples, a great recipe and saved for later use! This is PERFECT for fall. All of the apples are just coming in. And I love to make homemade applesauce. Now I know what to do with it. YUM!!! Grain free option that is easy to make, love this! Especially with the addition of apples! I am curious if you’ve ever tried this without coconut? I know the coconut flakes would be easy to substitute, but I imagine the coconut flour is crucial to forming the clumps since it absorbs so much moisture. Just wondering! 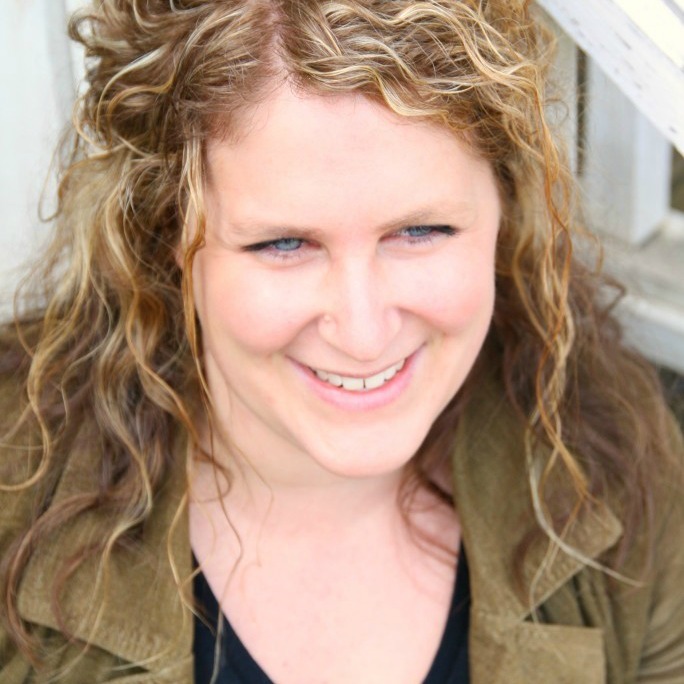 I have a kiddo with a coconut allergy – so sad! Would this work with soaked and already dried/low temp roasted nuts? Hi Julia! Yes you can just skip the soaking part!